Catalpa Sphinx Moth caterpillar or "hornworm" with frass (droppings) behind it. Catalpa Sphinx Moth caterpillars (Ceratomia catalpae) can only survive by feeding on leaves of their host plant trees of Catalpas, thus the inclusion of the tree's genus name even in its scientific name. Luckily for this species of hawk (aka sphinx or hornworm) moth, both North American species of trees (Northern and Southern Catalpas) have been planted as ornamentals well outside their natural range, including in the DC region. With it arrived the caterpillars to feed on it. Catalpa Hornworms or Catawba Worms, as they're sometimes called, are large, colorful (variable mix of black backs and yellow sides mostly) caterpillars with the spike typical of hornworms on the back end. They group together when young (the eggs are laid in rafts numbering several hundred) but become more solitary as they mature. They will commonly thrash around and regurgitate green liquid if they're bothered. Catalpa or Catawba Worm. It has already regurgitated some of its goo on my fingers behind it. Catalpa Worms are often used for fish bait and the tree itself is sometimes referred to as the "fish bait tree." The trees occasionally were even planted in small groves in the South for this purpose. Bass supposedly find the Catawba Hornworms irresistible. They've even been sold in bait shops in some parts of Florida. The caterpillars can break out in huge numbers, sometimes with two generations in a year, and are capable of defoliating the tree. For the most part though, the tree recovers with no long lasting harm. They usually do not have population explosions on the same tree in subsequent years. More over, the caterpillars have 15 species of parasitic wasps that feed on them and quickly reduce their numbers. 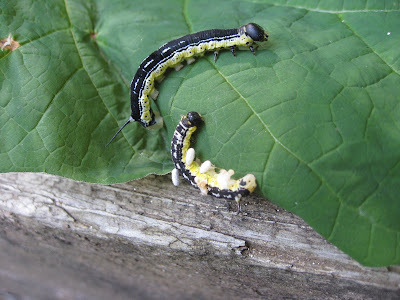 With the spread of the Catalpa trees outside their native range and into our region, so have followed the Catalpa Sphinx Moth caterpillars, and the numerous parasites who need them have also followed. Two Catalpa Hornworms. The bottom one is parasatized with Braconid Wasp cocoons. Many of these wasps are in the family Braconidae. Braconid wasps are very small and cannot sting people. They are however parasitoids and kill the host caterpillar. 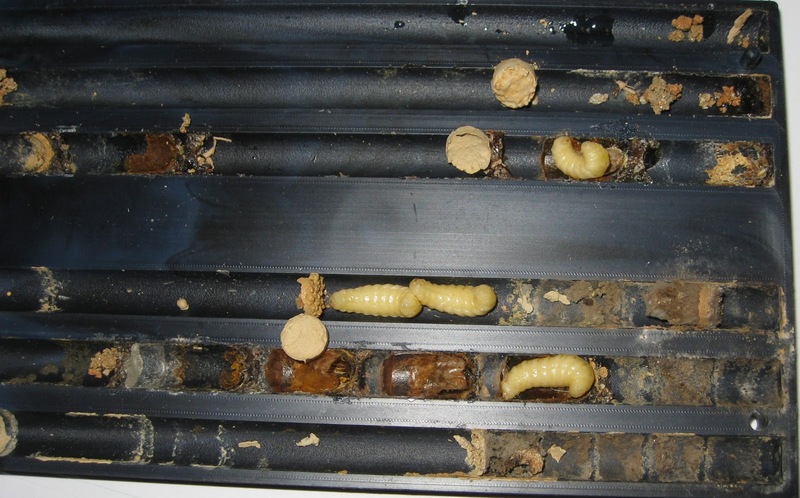 Parasites may harm and certainly do not help their hosts, but don't always kill the host. Parasitoids always kill or sterilize them. People often find caterpillars (including Catawba Worms) with little sacks attached to them that they assume are eggs. These are actually the pupae, or cocoons, of the wasps that have finished feeding and are metamorphosing into adults. The caterpillars, though often stunted and slow to react, look alive with their extra baggage of cocoons, but the damage has been done and their days are numbered. Removing the cocoons does nothing as the caterpillar is doomed. Its non-vital organs have been consumed and in essence only a zombie remains. A Braconid Wasp (Apantles congregata) has just emerged from its cocoon near the spike on this Catalpa Sphinx Moth caterpillar. This may seem cruel, but they keep the number of these caterpillars in check and thus keep everything in balance. Nature isn't always kind, but it is interconnected and fascinating. Giant Resin Bees (Megachile sculpturalis), perhaps better called Sculptured Resin Bees since there are bigger ones in the world, are quite active this time of year. The largest Megachilid bees in North America, they're not supposed to be part of our landscape. They can reach an inch long, particularly the larger females, and are among the largest of any bees in our region. Megachilids such as Mason, Leaf-cutter, Carder bees, and their allies mostly carry their pollen on modified "hairs" (setae) on their bellies as opposed to the pollen baskets on the hind legs of many other bee families. Two Giant Resin Bees facing off. You can see the pollen on the "scopa" or pollen hairs on the belly of the lower one. They actively compete with each other, even stealing each others resin. Giant Resin Bees are native to Japan and other parts of Asia. They first appeared in North Carolina in 1994 and have since spread throughout most of the South and into Canada. They have also now been introduced into Europe, having been captured in France and Italy in 2008. What affect they have on native bees, other pollinators, and plants still needs to be confirmed, but they certainly compete for similar resources at least. It appears that despite their large jaws, Sculptured Resin Bees do not actually excavate very much or make their own holes. So they use cavities and holes they find, often competing with other creatures who also need them. 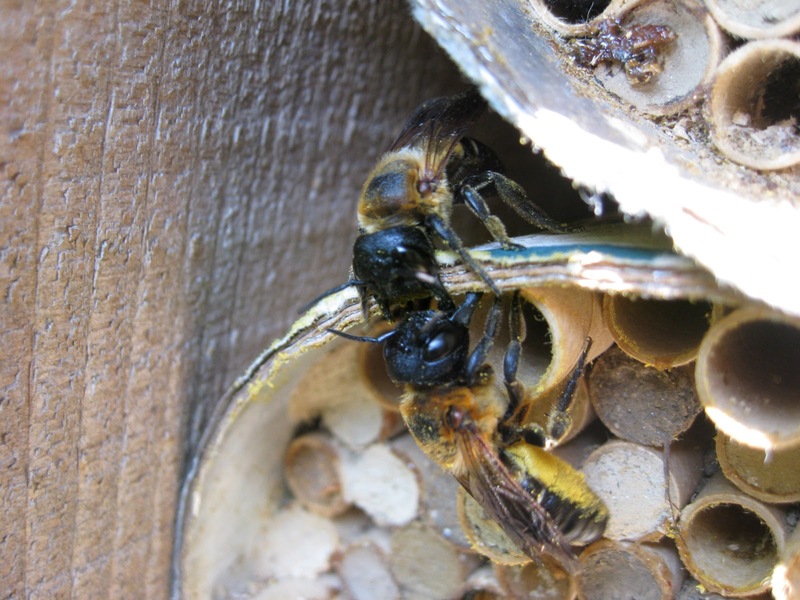 This is especially true with Carpenter Bees, with the Resin Bees often using their old holes and perhaps keeping the Carpenter Bees from then using the burrows later on when they need them. Some claim the resins the bees use can harm or even kill Carpenter Bees. Others have reported that they attack other bees, even killing Honey Bees. A Giant Resin Bee takes over a Carpenter Bee hole. 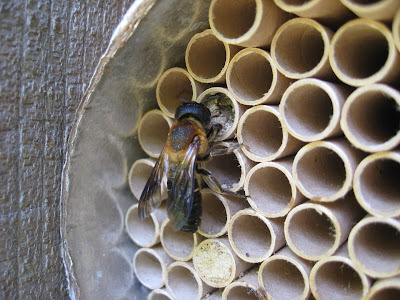 I myself have noticed them using Mason Bee boxes and tubes that I've put out. Luckily almost all the Mason Bees have completed their active life cycle by mid summer when these exotic bees emerge and become active. 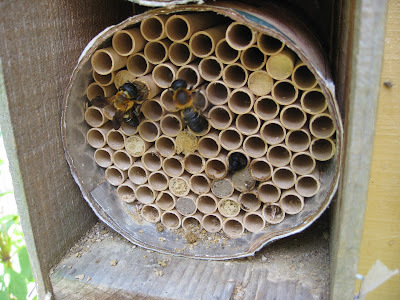 The Mason Bees are nestled in sealed tubes by then. But I've seen Sculptured Resin Bees trying to make use of the empty holes and tubes, which are then not available the next spring for Mason Bees, or the Leaf-cutters that sometimes also utilize them. 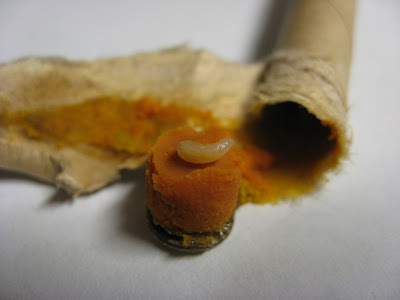 More disturbingly, I have often found the paper tube inserts or tubes themselves (both empty and those with sealed Mason Bee larvae) either completely pulled out or half way pulled out of the boxes with Giant Resin Bees then utilizing the now-larger holes. I've never caught one actually pulling them out (though I've seen them mouthing them), but I think it's perhaps more than a coincidence. Two Sculptured Resin Bees seal their own tubes and provision others in a Mason Bee box. Some tubes are still empty and available and some have had their paper inserts removed. Like most members of the Megachilidae family, both males and females visit and pollinate flowers. 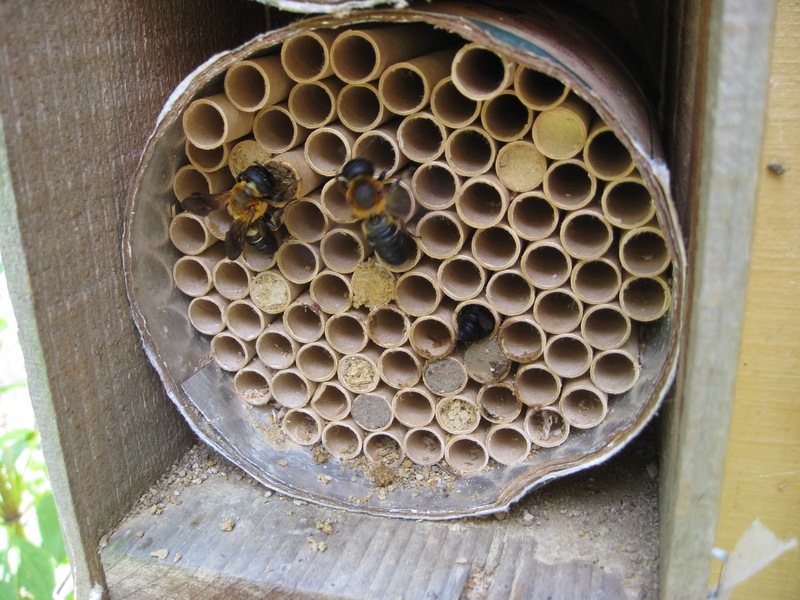 These are solitary bees, with each female choosing a hole or cavity to set-up housekeeping. With no queens, workers, or guards (like the vast majority of bees), she takes on every role by herself. 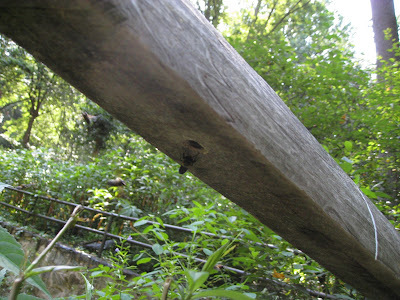 Sometimes many females will utilize the same area or piece of wood if the location or situation is very favorable. Pollen is collected and mixed with nectar to make a ball of food that is deposited in the hole. After enough is collected, she lays a single egg and seals the cell, often with tree resin as well as mud and bark. She might complete up to 10 cells per hole or tube before sealing everything off again, often with an extra layer of resin. A Giant Resin Bee egg attached to its food hoard at the end of a cell. When the eggs hatches, the developing bee larva feeds on these food stores throughout the summer. 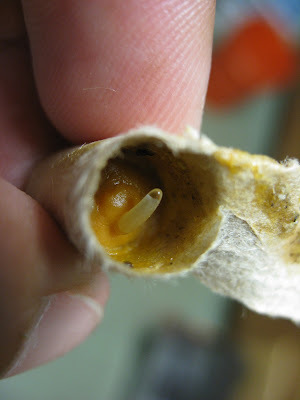 It will pupate and spend the winter in its cell before pupating and emerging in mid summer as an adult bee that then starts the cycle all over again. A newly hatched Giant Resin bee larva on top of its food stores. An opened Mason Bee house that instead is full of various stages of developing Giant Resin Bees and their cells. Again, no one is sure if these exotic bees affect our native pollinators and especially our bees. It appears though that at minimum they compete for food and nesting sites, if they don't outright attack or kill other bees. That they are also one of the primary pollinators for Kudzu in their native lands is also unnerving, since this invasive plant certainly doesn't need any more help reproducing. Giant Sculptured Resin Bees have spread dramatically through both North America and Europe and may indeed be something to worry about. We shall see. I noticed that the Honeyvine (Cynanchum laeve) was in bloom today. I always seem to notice its sweet scent before seeing the vine or its small flowers. It can be quite abundant, actually sprawling aggressively over other vegetation when in ideal condition, but not always noticed until you smell its blooms. Many people do not know that this native vine is also a host plant for the Monarch butterfly caterpillar. While not in the same Genus, Asclepias, it is in the same milkweed family. They may not like it as much as Common Milkweed, but it is comparable to some others and maybe more preferred than some. 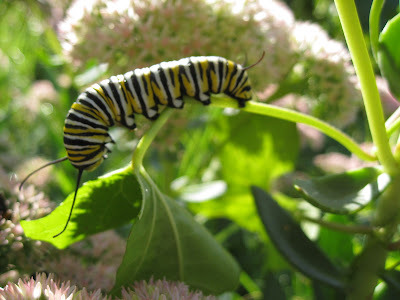 A Monarch caterpillar feeding on Climbing Milkweed. So this is an interesting vine with lots of things going for it, if you have the space to let it run wild.